Yema are custard candies we inherited from our Spanish colonizers of more than 300 years. Have you ever wondered how these heavenly like candies came about? The truth is, yema had a very interesting beginning in our history.The word “yema” actually means “yolk” in Spanish. During the Spanish occupation millions of egg whites and egg shells were used to build churches in the country. It was a technique in the olden times to use them as mortar to hold the stone together. And that left Filipinos with an overabundance of yolk. So as not to put them to was with their ingenuity and passion for food gave birth to recipes that calls for yolks: cookies (like uraro type), leche fland and of course Yema. In a bowl cream the egg yolk and condensed milk. Then pour in a casserole and cook slowly over medium fire. You should continue mixing it to avoid sticking. Cook it until it thickens. Add your chopped nuts and jackfruit. Let it cool and form the shape you want. You will have to use a regular frying pan to get the best result, not the non-stick one. Pour the condensed milk in pan and put on medium heat. Using a metal spatula, stir the milk as if you are scraping the bottom of the pan. This must be done continuously to avoid burning the milk and to prevent it from sticking at the bottom of the pan. This will also ensure that it is cooked evenly. You can tell that the yema is done if your condensed milk sticky. Let it cool and wrap in cellophane cut outs for easy serving. Start by beating the egg yolk with an electric beater. In a separate bowl, put a little bit of water (about 1 tablespoon) and add the grated zest of lime. Press them together and squeeze out the essence. Add this essence to your beaten egg. Pour in the condensed milk and mix well. Cook this mixture in a non stick pan over low fire while stirring constantly to avoid burning. When the custard thickens and change color turn of the heat and let it cool. Form some balls using a spoon and your hands with this custard. And now for the caramel. First dissolve your sugar in the water be sure that all the sugar are completely dissolve. Then add the cream of tartar and melted butter. Pour this mixture on a pan and cook slowly until it thickens as caramel. To test if your caramel is ready, with a teaspoon drop a small amount of caramel in a plate if it hardens immediately it is ready.. Dip one by one your yema balls in the caramel. My older sister used to make this when were were young. I will try this to ‘show off’ to my 3 young kids. this looks good. i will try to make one soon. thanks for posting. i’ll try to use recipe for selling… wish me luck. It’s very easy and very delectable thank you for the recipe!!!! 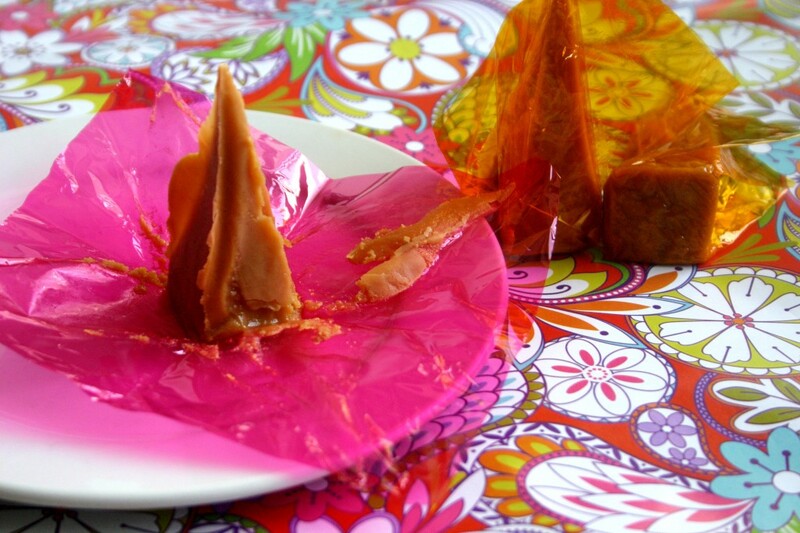 Masarap at malinamnam ang Yema, i’ll try to make a lot of it para sa give aways this coming Yuletide Season…. why those is has jack fruit on it yak………..did u know that it taste bad !!!!!!!!!!!!!! if u d0n`t like jack fruit d0n`t it eat . i am wondering if this is an acctual yema recipe, because i am having a troubling time finding the true one online, my philipino friend says the recipe comes from ilo ilo, so i am wondering if this is the original yema candy recipe. do you know? hmmmmmmmmmmmmm saraaaaaaaaaap gagawa ako nyan at ipapadala ko sa hubby ko…. can i ask if this recipe would result to a Yema that after some time will harden, not necessarily very hard but rather with dry texture and not a sticky one after you get it out from the refrigerator?? nag imas ti yemam!!! oooohh yeah!! Just wondering ’bout what to do with the melted butter? thank you for posting it ,now i can use it in our school cause we are vocational,and my course is foods ,so its better for me to know ,and tnx also for the tips! its our project,actually after cooking and wrapping it i and my groupmates will sell it into our campus,and we must have a 1000 profit so we will exempted in our periodical exam!ahehehehe! Ang sarap nman ng yema magluto kaya ako!!!!!!!!!!!!!!!!!! kasi 2 lng ang supot na binili ng tita ko sa pilipinas !!!!!!!!!!!!!!! I made this and it was chewy. I guess I expected it to be a bit dry (like those sold in the Phils). Did I do something wrong with this recipe? I’m confused by this recipe. The first part has 2 cans of condensed milk and eggs etc. followed by the procedure, then it is followed by 2 cans condensed milk and cellophane wrapper, followed by more directions to cook the condensed milk???!!! Please clarify. ’tis my favorite candy..my aunt used to cook yema for our merienda. glad i know how to cook it.. ?! ?? ?? ?? ??? ????? ?? ??? ??? ? Im interested on your product yema, how to make an order. please response this website.thank you. OH YEMA I STARTED SELING YEMA AT SCHOOL WAY BACK WHEN I WAS AT GRADE 4 UP TO 4RTH YEAR ! IT WAS MY SISTER WHO COOKED IT THEN I LEARNED TO MAKE IT BY MY OWN WHEN I STARTED IN HIGH SCHOOL ! I WAS NAMED YEMA GIRL THEN LATER ON SOME OF MY CLASSMATES AND EVEN OUR TEACHER IMMITATE ME BUT THEN THERE WAS A BIG DIFFERENT BECAUSE THIER YEMA IS REALLY HARD AND TIRING TO EAT SO MY CLASSMATES CHOOSE TO BOUGHT ON ME BECAUSE MY YEMA IS EASY TO EAT AND THE ONLY SECRETS I AM GOING TO TELL YOU IS JUST ADD SOME SWEET BISCUITS ONLY AND U MUST HAVE TO KNOW THAT TO MUCH BISCUITS THE RESULTS IS ALSO NOT GOOD ! THATS ALL ! JUST TRY IT ! hi josephine pa send naman ng recipe please. thank you for posting. magagamit ko to for small bussiness. Try the best custard candy in town at Mc Domeng Hamburgers located in Obando, Bulacan. Surely you’re gonna crave for more. Truly the best Bulacan Sweets to enjoy. Best candy ever I think. Ang sarap! Sa party ko ito gagawin. This recipe is confusing. There is a procedure with eggs and another direction with just condensed milk. What is the correct one? Thanks for the simple recipe. hmmmm… I will try your recipe. I’ll let you know the result. salamat sa sa recipe na to at natuto ako akong gumawa na masarap na yema! pwede bang malaman kung pano nyo na shape ng ganyan yung yema nyo? ilang beses na kasi akong gumagawa ng yema diko makuha ang shape na yan. at wala bang skyplakes yan? sa 2 cans ng condense ilang yema ba magagawa don? try ko nga gawin like kc ng mga anak ko! When do you mix in the melted butter? I made YEMA this SEASON 2012, and I brought to our family Christmas potluck. I put in one corner of my mom’s cabinet. I’m so quiet not to say anybody I made YEMA. Suddenly, my sister saw it and oohh..oohhh. I know her daughter loves YEMA, too and everbody was picking one but more until it finished. Now on this NEW YEAR 2013, I will make again and I know and hope that I could introduce to my friends my YEMA, it’s so good taste and you’ll love it to bite. ang sarap namn talaga ng YEMA na yan I’ll try to cook that and so yummy? WOW marunong na me gumawa Yema candy thanks sa web. na ito. Mabuhay! This is a place for all Pinoy food lovers! It's about time the world discovers the wonders of Filipino cuisine. Hop on and enjoy our daily culinary journey.